AnyFound Photo Recovery is a free and easy to use application that allow you to scan and recovered deleted, lost, corrupted digital photos, images, pictures and snap shots photographs from your hard disk drive or even from your USB drives, which you accidentally deleted, lost or missed from your hard disk drive or even from your USB drives. Provide thumbnail preview of recoverable files before actual data recovery. Supports recovery of almost all formats of the images, including BMP, JPEG(JPG), GIFF, PNG, PSD, TIFF, WMF, EMF, ICO etc. 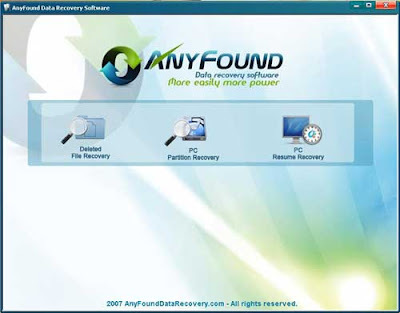 Recovers all lost, missed, deleted pictures from the Windows hard disk drive and USB drives. Supports recovery from accidentally formatted or corrupted media. Easy and safe to use without requiring any professional technical skills! Totally Free of Charge: free download, free to use, free technical support. It supports almost every media format so that you can recover data from hard drive, floppy disk, jazz drives, zip drives and USB storage media.